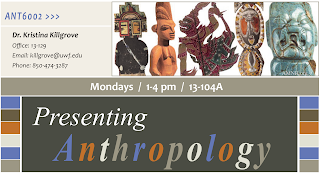 Last Monday was the first week of Presenting Anthropology, in which I introduced myself and my thoughts on the need for anthropologists to be more public about our work. The students also mentioned their current engagement with social media and other forms of presentation - most are active on slightly more private spheres (e.g., Facebook), but some were already tweeting about their lives, ideas, and research. In order to get them thinking about the progression of the course, I asked them to share an interesting form of presentation they'd seen recently, something that stood out in the new, different, or effective way it communicated information. I didn't bookmark these, unfortunately, so I can only share my current inspiration, Nobel laureate Leon Lederman, who occasionally sets up a delightfully hand-created sign and answers science questions on a street corner. It's particularly charming to me because of the Peanuts-style "Advice: 5 ¢" idea it evokes, but I really wish I had the courage to sit on the street and invite strangers to ask me questions about anthropology. Today was our first to cover a specific set of "required media," on the very broad topic of Anthropology, Digital Humanities, and Web 2.0. The readings that I assigned are a sort of foundation for the rest of the course, which will deal with the theory behind and the practicalities of being public in anthropology, in that the question of access (and the sub-question of audience) is incredibly important in academia today and involves aspects such as intellectual property, copyright, and, of course, money. Owing to the tragic death of Aaron Swartz over the weekend, I brought up questions of control and legal issues with the internet and linked to reactions from anthropologists Eric Kansa (whose Archaeology 2.0 we read parts of this week) and Kerim Friedman (at Savage Minds). I also took this opportunity to explain my background in open software; not that I have any role in its creation, but I have used numerous open source programs because of the influence of my computer scientist husband. I am generally of the opinion that information should be free and should be easily available and accessible to a wide variety of publics; yet at the same time, I haven't published the entirety of the data I collected for my dissertation research, as I'm waiting for some ill-defined time when I will be "done" with it. So rather than talking about the theory behind this topic (e.g., whether we can discuss open access as wresting control over the means of production in a sort of Marxist framework), I invited the students to talk more generally about what access and openness mean to them in their work. We talked a lot about the practicalities of making archaeology more open and of making archaeology more of a dialectic between us (the producers of information) and the public (the consumers of information). Several of the students have experience in the museum setting through the Florida Public Archaeology Network, and most of them have experienced being on an archaeological dig and needing to talk to interested passers-by. For as much as they claimed not to have liked the chapter by Michael Shanks ("Digital media, agile design, and the politics of archaeological authorship"), we sure did talk a lot about it. Shanks argues that archaeology needs to be more "agile," a term that he draws from software development, the idea that software shouldn't be monolithic, anticipatory of every way that every customer will use it, but rather changeable to meet the needs of the end users. He's not quite using this term right, but as an analogy it makes a bit of sense: rather than waiting for years to collate data from an archaeological site and publish it (the "waterfall" version of software design, in which a major problem is getting scooped by another company), Shanks advocates putting data online immediately and constantly updating it. This is echoed in the piece by Colleen Morgan and Stuart Eve [available here] on "DIY and digital archaeology." I particularly liked the Morgan & Eve article, but it and the Shanks article left me with questions about other duties we have as anthropologists -- duties to Native Americans not to publish photos of skeletons, for example, or duties to interlocutors not to name them or offer identifying information. Transparency is a valid goal, but it shouldn't come at the cost of the people we're talking to, and the Coleman review article raises this very point. It's a difficult conversation to have, and the solution definitely isn't one-size-fits all. 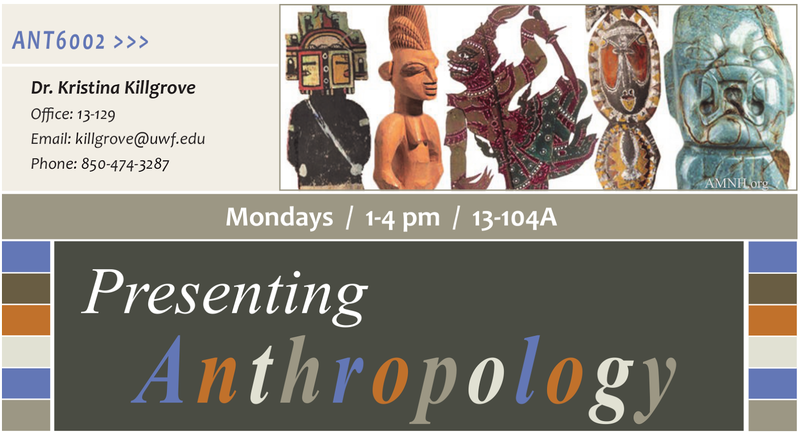 Here's a storify of today's tweets, filed under the hashtag #shareanthro, which Sarah seems to have come up with. It was particularly amusing when Nicholas Laracuente (@Archaeologist) jumped in; the students didn't seem to be expecting to be engaged in this conversation by an "outsider" right off the bat (and they were also impressed by his Twitter handle! Must have been an early adopter...). I'm not sure how long it will take me to get used to the idea of live-tweeting a class. Don't get me wrong, I think it's all kinds of awesome. But I come from an era of 35mm slide projectors, so this is all new and different and interesting and a little bit panopticonish... but mostly cool. UWF and FPAN are doing a great deal of public outreach in archaeology already (it's one of the reasons I was excited to take this job), so I'm hoping to harness that interest among the grad students and encourage them to produce innovative presentations of their own research this semester. Next time: I'll post the reading list for Weeks 3 & 4, when we'll discuss what the benefits and drawbacks are to a more engaged, public anthropology.